Shen Min RX Hair Nutrient Extra Strength Formula for Healthy Hair Shen Min Rx is an EXTRA STRENGTH formulation of the world-renowned Shen Min hair nutrient plus a powerful blend of six complimentary Chinese herbs for purifying the system and neutralizing biological and metabolic by-products to help intensively nourish hair follicles and roots. Rehmannia, dioscorea, Chinese mushrooms plus other tonic herbs help you control hair loss and thinning hair…Naturally! Also see Shen Min Hair Nutrient Original Formula About Shen Min Shen Min has put together a combination of Chinese herbs / medicine with modern science to create the latest breakthrough in achieving full, lustrous, fast growing hair. 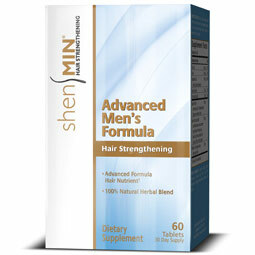 By combining a powerful mixture of standardized herbs such as He Shou Wu & Horse Chestnut Extract with vital co-factor nutrients such as Silica, Biotin, Saw Palmetto & other nutriceuticals, Shen Min helps to maximize your hair’s potential naturally! Whether you are male or female, Shen Min can help your hair return to it’s youthful state of vibrance and fullness. Proven blend of He Shou Wu Products for internal and external use Supports embryotic follicular activity naturally For hair loss & thinning hair Specially formulated for Men and women’s needs "Energizes" follicular growth 100% natural What is He Shou Wu? He Shou Wu (also called Fo-Ti) is commonly used in China, and has been for many centuries. Originally, it was used to turn aged, greying hair back to it’s youthful darker color. In time, it was also found to regrow hair in some users. It has also been found that He Shou Wu is very good at lowering LDL cholesterol and is also used as a tonic for the kidney’s and liver to aid excretion. Combined with the abilities of modern science, He Shou Wu has been blended into the proprietary formula available as Shen Min. Shen Min Rx Ingredients Supplement Facts Serving Size: 2 Tablets Servings Per Container: 15 Amount per Serving % DV Shen Min 1755 mg (a proprietary blend of 12:1 standardized He Shou Wu (Fo Ti) root extract and He Shou Wu root powder) Herbal Purification Blend 600 mg (Eclipta prostrata root, Radix rehmannia root, Dioscorea villosa root, Pocos cocos aerial parts, Frucus mori albae root and stems, Frucus ligusti lucidi whole plant) BioPerine black pepper extract (Piper nigrum) 3 mg Other Ingredients: Dicalcium phosphate, microcrystalline cellulose, croscarmellose sodium, stearic acid, magnesium stearate, pharmaceutical glaze. Directions: Take one Shen Min Rx tablet two times daily. For best results, should be taken for a minimum of 3-4 months. As with any nutritional product, please consult your physician before using. Lean Grow Low Carb Protein This optimally balanced complex of whey concentrate, soy isolate, egg white and milk casein delivers a robust 28 grams of muscle building protein with only 7 grams of carbohydrates per serving. With its generous BCAA content, delicious vanilla flavor, and easy mixing, NOW Lean Grow is a convenient low-carb meal, perfect for replenishing hard worked muscles or balancing one’s diet. NOW Lean Grow – four superior sources of protein in one convenient product. Nutrition Info Serving Size: 1/2 cup (40g) Amount Per Serving % Daily Value Calories 150 Calories from Fat 15 Total Fat 1.5 g 3% Saturated fat 0 g 0% Cholesterol 0 mg 0% Sodium 220 mg 10% Total Carbohydrate 7 g 3% Dietary Fiber 2 g 8% Sugars 3 g Protein 28 g 56% Vitamin C 4 mg 7% Calcium 97 mg 10% Iron 3 mg 17% Lean Grow powder 40 g Stevia rebaudiana leaf extract powder 200 mg Suggested Use: Add 1/2 cup (40g) to 8 to 12 ounces of cold water, milk, or your favorite juice and blend. Also consider adding fresh fruit, NOW Super Enzymes, and NOW Flax Seed Oil for enhanced nutritional benefit. Additional calories and nutrients are provided. Free of: flavors and colors. Other Ingredients: Micro-filtered whey protein concentrate (providing approximately 56% B-lactoglobulin, 25% A-lactalbumin, 12% Immunoglobulins, and 6% Serum albumin),Soy isolate protein,pure egg white protein,milk casein protein,natural french vanilla flavor,Stevia rebaudi. Warnings: NOTICE: USE THIS PRODUCT AS A FOOD SUPPLEMENT ONLY. DO NOT USE FOR WEIGHT REDUCTION. Shen Min Serum – Hair Volumizing Serum Instantly builds fullness, volume & texture for fine, thinning or limp hair. Shen Min Hair Volumizing Serum helps thicken hair by strengthening the diameter of each individual strand, and enhancing body, volume, and shine. Shen Min Hair Volumizing Serum instantly turns fine, thinning or limp hair into thicker, fuller hair in just one application! Biotech’s Lipisomal BioPlex, a natural hair and scalp revitalizers, thickening agents, texturizers and hair strengtheners, infusing vital nutrients into the cortex of the hair to strengthen and expand the diameter of each strand for optimum body, volume & shine. Volumizing Hair Serum Ingredients: Aqueous Extracts of Chamomile, Clary Sage, Rosemary, Rhatania Root Extract & Ginkgo Extract, Liposomal Bio-Plex (mixture of hydrolyzed wheat protein, hydrolyzed wheat oligosaccharides, panthenol, sesame oil, lecithin, retinyl palmitate, octyl methoxycinnamate), Biotin, Carbomer, henna Extract, Methacryl Ethyl Betaine/Acrylates Copolymer, Sodium Hydroxide, Triethyl Citrate, Cyclomethicane, DMDM Hydantoin, Methylparaben, Propylparaben, Dimethicone Copolyol, Disodium EDTA, Fragrance Suggested Use: For best results, apply to clean, slightly damp hair, then style as usual. Blow dry for added volume. Learn by distance attunement. FAQs, course details. Free distance healing. Links and recommended books. Multilingual site maintained by Mona Khalaf. Offers long distance healing by email or phone. Based in Toronto, Canada. You are currently browsing the Energy Healing For A Stress Free & Peaceful Life blog archives for November, 2007.